CAMBODIA'S strongman Prime Minister has issued a chilling threat to protesters in Sydney this weekend - saying he will beat them up if they burn effigies of him. Anger is mounting among members of the South-East Asian nation's expat community in Australia who say Cambodia has shifted towards authoritarianism following last year's ban on the main opposition party. 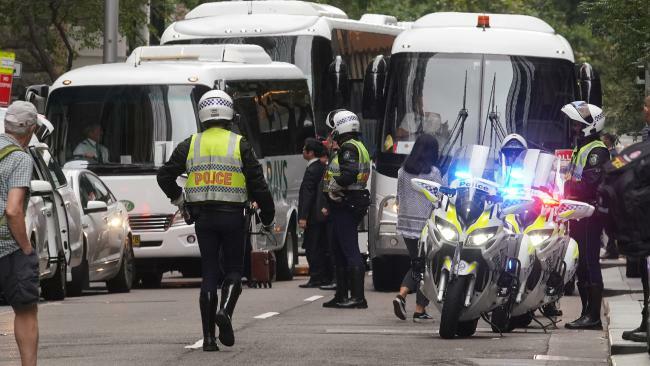 Over the weekend, hundreds of Australian-Cambodians and supporters will protest against the rule of Prime Minister Hun Sen, who is attending the Association of Southeast Asian Nations (ASEAN) summit in the Harbour City along with other Asian leaders. It follows the widely criticised arrest of Cambodian opposition leader Kem Sokha and the forced closure of an English-language newspaper. However, Mr Sen, who the protesters call a "dictator" who "rules Cambodia with an iron fist", issued a threat to activists ahead of the summit. 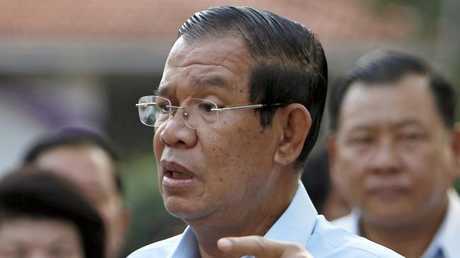 "I want to make this clear," Hun Sen told reporters. "If you have the right to burn me, we have our right to beat you up. There is nothing wrong with that. I will follow them home and grab them." Prime Minister Malcolm Turnbull is expected to raise concerns about Cambodia's crumbling democracy and human rights record when he sits down for talks with his counterpart this weekend. Mr Turnbull is hosting leaders from the 10-country ASEAN and is expected to hold bilateral talks with Mr Sen this afternoon. Separate groups of protesters are mobilising in response to the summit - as they try to raise awareness of the Rohingya crisis in Myanmar. 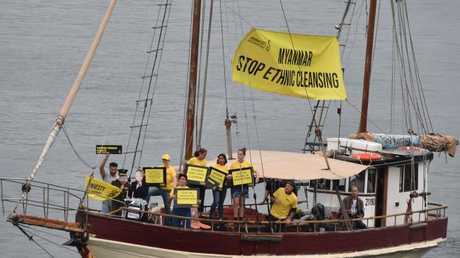 Amnesty International held a demonstration on a boat near Barangaroo on Friday to draw attention to the plight of Rohingya people in Myanmar who have fled violence. The United Nations has dubbed the crisis a "textbook example of ethnic cleansing". "ASEAN has been shamefully silent on what is happening in one of its member states so far," the advocacy group said in a statement earlier this week. Another community group will also gather for the Rohingya in Hyde Park on Saturday. Save the Children Australian spokesman Mat Tinkler said the summit provided an opportunity for Mr Turnbull and Foreign Minister Julie Bishop to condemn the violence in Myanmar. "Australia has been too cautious in not calling for Myanmar to be held to account for the cause of the crisis, favouring an engagement at all costs approach to diplomacy," Mr Tinkler said. Foreign Minister Julie Bishop said the Cambodian leader will not be able to carry out his threat on Australian soil. However, she insists Australia intends to press its Southeast Asian neighbours, including Cambodia, about serious human rights issues at the leaders' summit. 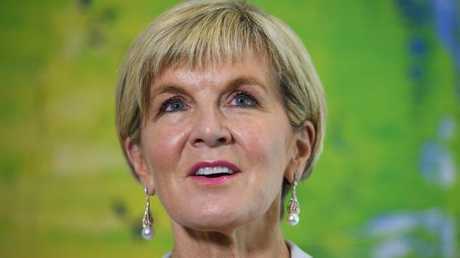 "We are certainly going to raise our concerns with the Cambodian delegation," Ms Bishop told ABC Radio today. Meanwhile, the widow of a slain political activist will share her personal heartbreak at a protest on the sidelines of the summit. Hundreds of Cambodian expats are expected to attend the Hyde Park rally on Friday afternoon, protesting against Hun Sen's visit to Australia. Bou Rochana, whose husband Kem Ley was murdered in a suspected political assassination, will address the Sydney protest. She and her five children were granted refugee status and moved to Melbourne last month after 15 months in limbo in Thailand. Mr Ley was gunned down in 2016 after he had made comments critical of the prime minister's business dealings. Former foreign minister Gareth Evans, who helped bring peace to war-torn Cambodia in the early '90s, last week said the "manifestly indefensible" refugee resettlement deal had compromised Australia's response to the Cambodian situation. She was once the face of hope in authoritarian Myanmar, but Aung San Suu Kyi will not be receiving the warm welcome she had at the summit two years ago. She famously led the National League for Democracy (NLD) into government in Myanmar with a global outpouring of support and goodwill - after she had previously spent years languishing under house arrest for opposing country's military junta. However this time, concerns will be raised over the Myanmar military's controversial treatment of the Muslim Rohingya community in rural Myanmar, and Ms Suu Kyi's refusal to denounce it. Controversial strongman leader of the Philippines Rodrigo Duterte is a no-show, citing more pressing developments at home as he faces international censure over a brutal drug war that has left thousands dead. President of Indonesia Joko Widodo, who has indicated his support for Australia to join ASEAN, will be attending. Mr Turnbull also met Vietnamese Prime Minister Nguyen Xuan Phuc to increase diplomatic ties between the two countries last night, ahead of the summit. They signed a new strategic partnership aimed at deepening defence, security, trade, investment, development, education and tourism links. Thai Prime Minister Prayut Chan-o-cha; Laos Prime Minister Thongloun Sisoulith and Brunei's Sultan Hassanal Bolkiah will also be looking to make a mark on the summit. Together, they will discuss a broad range of issues, including sustainable development, climate change, disasters, the South China Sea dispute, transnational crime, terrorism and the economy.